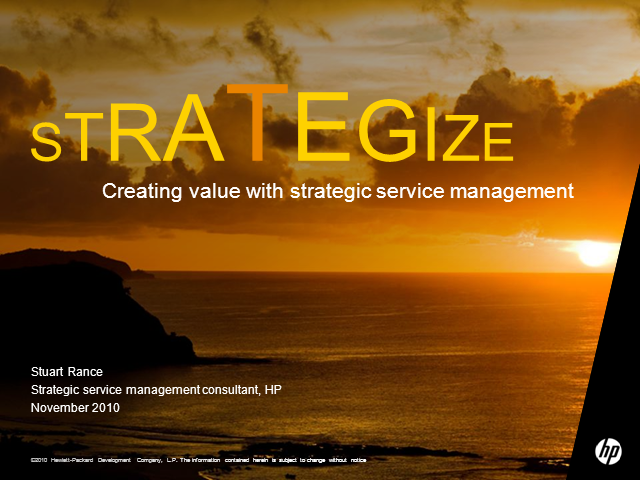 It can be very hard to start implementing service strategy when you are busy dealing with today’s issues. This presentation will help you to understand the benefits of taking a strategic approach to service management, and show some practical steps you can take to get started. For many years Stuart has worked with HP’s largest customers, helping them to improve their IT Services. Stuart develops and delivers a wide range of services, helping customers use service management to create business value. Stuart is a senior ITIL examiner for APMG, a chartered fellow of BCS, and a fellow of the institute of service management. He is a co-author of the ITIL V3 glossary and of a number of service management pocket guides for OGC/TSO and itSMF, he is currently writing the next version of the ITIL Service Transition publication.